Skin & Bones is an abstract design project creating a building section from a the negotiation of a vegetable-derived skin with a systematically interlocking structural bone system. By forcing these two dissimilar systems to navigate their borders, a dynamic space is created, allowing the body to inhabit spaces within the building wall. The building skin is derived from the skin of the bitter melon. Specifically, the building skin takes advantage of the varied texture scales to create a skin that can maintain a superstructure, while allowing for small scattered apertures. The bones of the building are constructed out of three different puzzle pieces at two different scales, that snap together to create a variety of hallways and interstitial spaces within the building wall assembly. 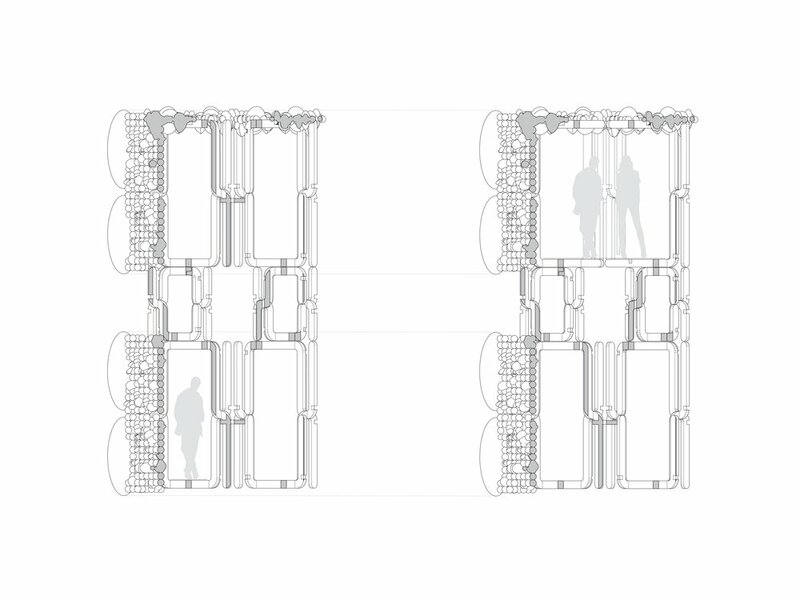 When the two dissimilar skin and bone systems come together, they form a habitable building wall composed as a network of tunnels with occasional aperture to the external environment.